Gubernatorial candidate Abdul El-Sayed greeting residents in Detroit’s North End neighborhood. Gubernatorial candidate Abdul El-Sayed (Democrat) is used to the heat. He is 33-years-old, Muslim, son of Egyptian immigrants, and some believe that those attributes will prevent him from becoming the next governor of Michigan. 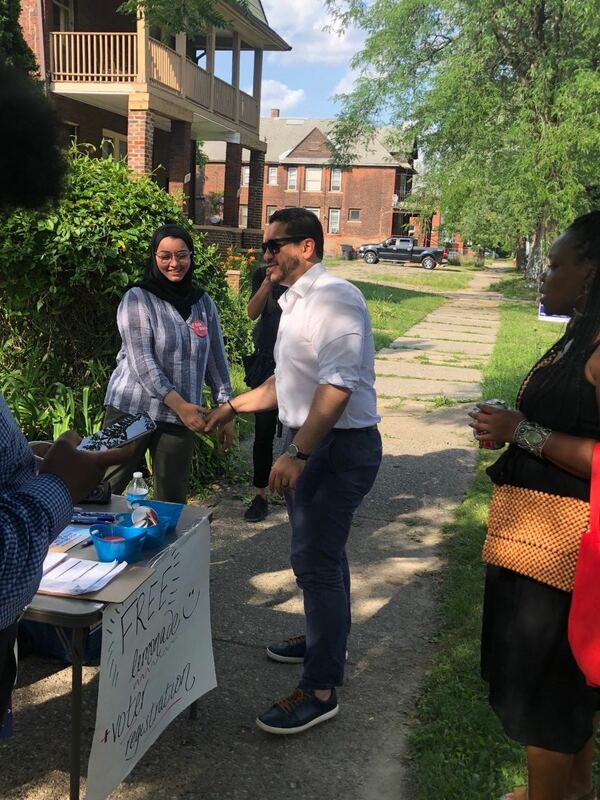 But that did not stop El-Sayed from enduring the 90-degree weather to visit residents in Detroit’s historic North End neighborhood, as part of the “Knock Your Block” initiative to allow voters to get to know him and about his progressive ideals. The event was held at the WHLGN House (pronounced hooligan), which is home to a group of Detroit artists, entrepreneurs, photographers, and more. El-Sayed spoke to the crowd for 15 minutes, outlining his presence in the neighborhood just south of Highland Park and his plans as governor. El-Sayed became the Health Officer and Executive Director of the Detroit Health Department in 2015, making him the youngest health officer in a major American city at the time, at age 30. In that role, he was in charge of rebuilding the Detroit Health Department, after it was shut down due to the city’s bankruptcy in 2013. He graduated from the University of Michigan in 2007, delivering the student commencement speech and he attended Oriel College, Oxford as a Rhodes Scholar, where he completed a Doctor of Philosophy in Public Health in 2011. In his first year, El-Sayed led efforts to oppose increases in sulfur dioxide emissions by Marathon Petroleum’s Southwest Refinery, which resulted in reductions in overall emissions. He also led efforts to test Detroit Public Schools for lead in the wake of Flint’s Water crisis, testing all 360 school buildings in just six months. He also led efforts to provide free glasses to children in Detroit. El-Sayed may not have the endorsement of the major labor organizations and the support of former boss Detroit Mayor Mike Duggan, but he carries himself as a man for the people and has based his campaign around Michigan’s people. Abdul El-Sayed campaign members in front of the WHGLN House in North End Detroit. One of the biggest issues affecting Michiganders is auto insurance. The state of Michigan has the highest auto insurance rates in the country, with residents paying $2,610 a year. The average American pays $1,427. Motorists in Detroit pay upward of $5,400. Selina Michaels is a student at Wayne State University and rides a bike because she cannot afford to pay for school and car insurance in Detroit. She rode her bike to the Knock Your Block event and had the opportunity to meet El-Sayed and hear his plans to lower auto insurance in Michigan. El-Sayed said he plans to outlaw redlining and asking auto insurance to be health insurance, too. Lead Detroit Organizer Camille Johnson said the El-Sayed camp plans on doing four more Knock Your Block initiatives, as well as knocking on doors, education and criminal justice rallies to outline his plans for education and criminal justice, and several organized meetings around Detroit before the primary election. The last day to register for the August 7 primary is Monday. The general election date is November 6.